When NASA launched the Cassini spacecraft to Saturn two decades ago, flip phones were the pinnacle of cellular technology and using the internet required tying up your phone line. In the last 20 years, our technological lives have been revolutionized, and so has our understanding of Saturn, its moons, and our solar system, thanks to Cassini and its probe, Huygens. Perhaps most exciting, the mission has given us new targets in the search for life beyond Earth: its data revealed that the icy surface of Saturn’s moon Enceladus is hiding a liquid-water ocean with hydrothermal vents, deep-sea features that, on Earth, are teeming with life. 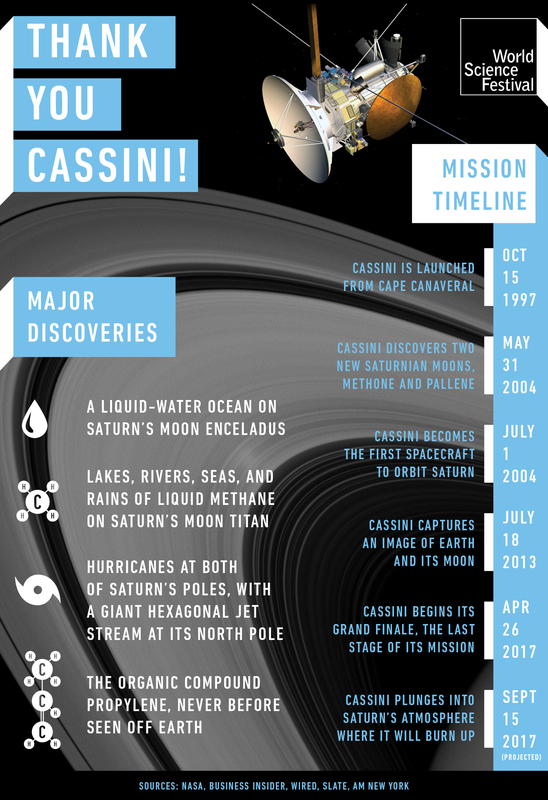 Here’s a look at Cassini’s mission and major discoveries. Join WSF Brisbane on our social media channels as we attend the live-streamed #GrandFinale and final broadcast of data from the Cassini mission at NASA’s Deep Space Communication Complex in Canberra, Australia.